We all know to call our friendly initial narrator Ishmael. He is full of good natured thoughts about the world and the voyage, though also a bit blue, brought to the sea as a cure for malaise, and philosophical, prone to meditate on each thing and person set before him. Beyond this, despite spending six hundred pages with him, we don't really get to know him as well as many of the people to whom he introduces us. And let me in this place movingly admonish you, ye ship-owners of Nantucket! Beware of enlisting in your vigilant fisheries any lad with lean brow and hollow eye; given to unseasonable meditativeness; and who offers to ship with the phaedon instead of Bowditch in his head. Beware of such an one, I say; your whales must be seen before they can be killed; and this sunken-eyed young Platonist will tow you ten wakes round the world, and never make you one pint of sperm the richer. Nor are these monitions at all unneeded. For nowadays, the whale-fishery furnishes an asylum for many romantic, melancholy, and absent- minded young men, disgusted with the carking cares of earth, and seeking sentiment in tar and blubber. Childe Harold not unfrequently perches himself upon the mast-head of some luckless disappointed whale-ship, and in moody phrase ejaculates: - "Roll on, thou deep and dark blue ocean, roll! Ten thousand blubber-hunters sweep over thee in vain." Very often do the captains of such ships take those absent-minded young philosophers to task, upbraiding them with not feeling sufficient "interest" in the voyage; half-hinting that they are so hopelessly lost to all honorable ambition, as that in their secret souls they would rather not see whales than otherwise. But all in vain; those young Platonists have a notion that their vision is imperfect; they are short-sighted; what use, then, to strain the visual nerve? They have left their opera-glasses at home. Perhaps reading Ishmael's thoughts is not the most profitable endeavor for us, and we should heed the warning and reconsider the voyage? 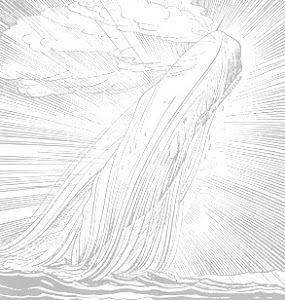 Even the most careful of critics mistakes or misstates Ishmael's voice as Melville's, or for that of our more omniscient narrator who emerges mid-book; yet I would propose that we think of Ishmael less as the authorial voice and more as the reader. Ishmael is our guide, our Virgil, and his eyes are ours as we leave shore and enter this world. Perhaps, in some truly mystical way, he unifies us with the author and characters. Ishmael's name, of course, is also of great significance. He is of the cadet branch of the Abrahamic tradition, Ibriham's forgotten and illegitimate son, telling us a book full of the biblical and the anti-biblical and the non-biblical, a sort of alternative universe to the great Christian mythology. I confess, I find this name an uncommon and extraordinary moment of brilliance, and an ongoing cause for "unseasonable meditativeness" as I read the book. Perhaps, we need not know much more about this whaling rookie who brings such wisdom to bear. Perhaps our central character is really not of much import, anyway.